Eric Johnson's long-awaited new album Up Close will be released soon, and the legendary guitarist's many fans will be amply rewarded for their patience when they hear this dazzling work that ranks right up there with his Grammy Award-winning Ah Via Musicom. You can read all about Up Close in our exclusive track-by-track preview, which includes commentary by Johnson himself. Below you can listen to the album's first single, Austin, featuring vocals by Jonny Lang. And If it's breathtaking guitar playing you're after, believe us when we say that Johnson pulls out all the stops on this wondrous cut. 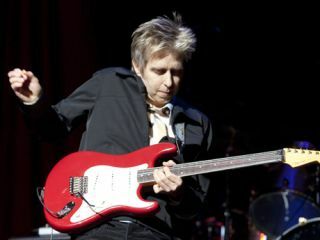 In a few weeks, Eric Johnson is graciously sitting down with MusicRadar for a most special interview, one in which you get to pose the questions! What to ask? Well, you can find out more about the recording of Up Close and what plans he has for touring. Or you can ask him about his continued involvement on the Experience Hendrix tour. Want to know something about his signature line of Fender Stratocasters? He'll tell you! Perhaps you'd like to know more about the Guitar Masters tour. Of course, you can always try to divine the secrets of his sought-after tone, but we have a feeling it has more to do with his fingers and limitless creativity as his gear. This is your shot to ask one of the world's most revered guitarists anything at all...so go for it! We'll pick the very best questions for EJ and pose them to him during our interview. Good luck!